The practice of exchanging rings as part of a marriage ceremony can be traced back to ancient Greece and ancient Egypt. Styles have come and gone over all that time and now there a multitude choices for couples getting married today. There are rings and bands made of almost every imaginable material, rings with gems and without and styles from virtually every period in history on the market – and reproductions of those periods, too. If you like the look of antique rings, you may be interested in learning more about filigree rings. As long as there have been artists and craftsmen working with metal there have been filigree rings. Usually they are made of gold, silver or platinum and the designs can be woven together, etched onto the metal or cut out. You will often see the word “lace” associated with filigree, and indeed, some designs are intricate and delicate like lace. However, filigree designs can also be more masculine in nature, incorporating geometric shapes. There are no set rules to the design of a filigree ring. Some filigree rings incorporate diamonds or other gem stones into the design. The range of designs is staggering. Celtic knot rings are a form of filigree. The design may work around a stone or other centerpiece or it may be a plain band with a consistent width all the way around. 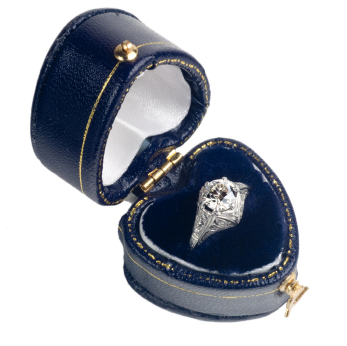 There are engagement ring/wedding band sets available as well as single rings. When you begin researching filigree rings, you will probably find references to antique rings because filigree was quite popular in the first part of the 19th century, so from the early 1900s to the 1920s. Rings from that time period are less precise than modern ones because the tools available for metal work were less precise. The lack of precision doesn’t diminish the value, though, because antique rings often have a luster and hue that is only acquired with time. Categories of antique filigree rings include Edwardian, Victoriean, Art Deco and Art Noveau in addition to Celtic rings. There are also modern designs reminiscent of all of those periods and new, unique designs based on no particular period. Your choice will depend on your personal style and your budget. Prices of filigree rings vary as much as designs. Clearly, rings with diamonds or gem stones will cost more than ones without. More intricate designs are more expensive and custom designs are as well. A cursory search of the internet reveals 10K gold filigree rings for under $50, and platinum rings for over $2000. If you don’t have much experience purchasing jewelry, you should begin your search at antique stores and jewelry stores rather than online. Researching online is a good idea, but you need to actually see a few antique rings in order to have a basis for comparison. You also need to talk to experts candidly, and ask to see reports from certified gemologists, especially if you are investing a large amount of your money. Since both tastes of buyers and the tools used by jewelers have changed over time, it is not a good idea to judge an antique ring by modern standards. If you find yourself in a jewelry store comparing a ring made in the last 5 years that costs $500 with an ring made in 1928 that costs $500, you will, as the saying goes, be comparing apples to oranges. While the quality of gems on older rings may be lower than quality on rings made recently, the craftsmanship will likely be far better on an older ring. The tools available today to examine gems today are much more powerful and accurate than those used years ago. However, jewelers took more time to make each ring, so the standards are entirely different. To have a reproduction of a ring from the 1900s made today would be incredibly expensive due to the time it would take. When you are purchasing an item that you will wear for a lifetime, you should certainly take the time to shop around and decide what you like, what your price range is and what is available. Just like the decision to get married shouldn’t be taken lightly, neither should the choice of wedding band.